Dedicated to the alchemy of life. 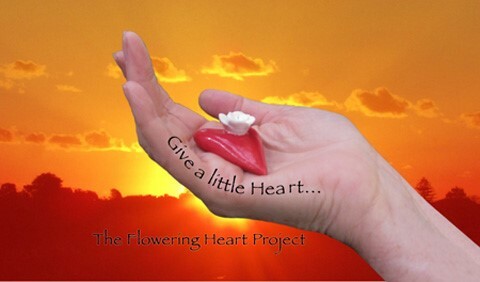 The Flowering Heart Project is a grassroots movement dedicated to ‘gifting love’ via small, red, heart shaped clay sculptures made with love for sharing among the people of the Earth. The VISION: To see Flowering Hearts blossom all over the world, representing the opportunity to transform each and every moment to love. The Flowering Heart is going green. As well as spreading love and gifting from the heart I have extended the reach of the project to now plant trees. I am a passionate long time member of TreeSisters: women seeding change, a global network of women who are committed to the reforestation of our forests and the re balancing of humanity’s relationship with the natural world. 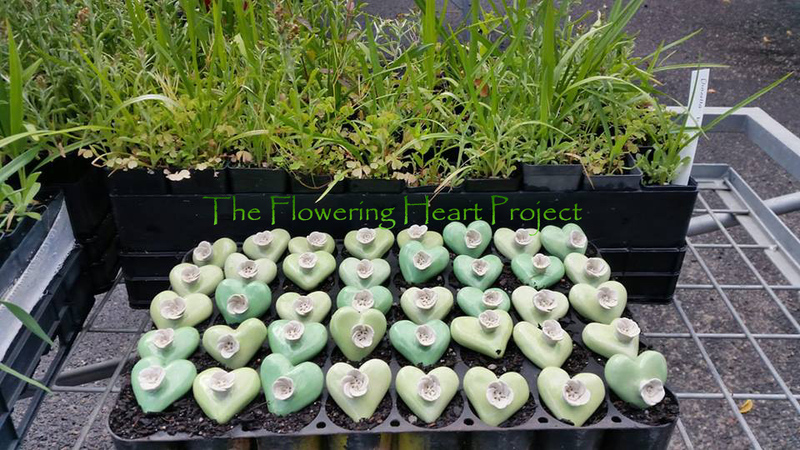 Each heart made with love carries the intention to re-robe and restore the planet in green. The heart purchased at Twenty Australian dollars plants 40 trees through www.treesisters.org. Thanks to the nursery at https://westgatebiodiversity.org.au/ for allowing me to take photos as they were as excited as me about the green heart and it possibility in helping green the planet. The Earth itself is the source; repository of all potential, human or otherwise. Transform solid clay into sculptural beauty – and in the process transform yourself. Immerse your hands in the healing clay’s of Mother Earth, exploring your creative heart through the elements of Earth, Water, Fire and Air. Ursula Dutkiewicz is a skilled facilitator of organic creativity. Be the creator and the created. Be guided through your own unique expression to create your flowering heart. In 2010 Melbourne ceramic artist Ursula Dutkiewicz spent a weekend with a small group of people in retreat. She had been through a long period of darkness, following the deaths of family members and friends. It was time to lighten up. During the two days of the retreat, she participated in a range of exercises designed to open the heart. When she returned to her studio, she began making red flowering hearts. Later that year, Ursula visited a Tarot reader and gave him a heart. He told her people would ‘gift them on’ a statement that moved Ursula to tears. For the next three months she made the hearts, pouring her own flowering heart into the clay. She made hundreds of them, each and everyone made with love. Now and then, moved by someone else’s sadness, she would gift them a heart. She was so touched by the transmission of love she shared with the person who received the gift, she began giving them to strangers. So began a journey devoted to uplifting the spirits of the myriad of human beings who crossed her path. And finally she understood: ‘The more I love life, the more it loves me.’ These heartfelt moments inspired what has now become The Flowering Heart Project. We have created space on Facebook to share your experiences of creating and gifting your Flowering Hearts through wall posts, via stories and photographs.